Robin Gibb's son has said he'll do 'anything' for his father to recover. The iconic Bee Gees singer slipped into a coma on Friday and doctors fear he has days to live. Robin-John, known as RJ for short, said: 'My dad has had a hard recovery from cancer. He told The People that everyone the family were 'praying' for a recovery and that he felt honoured to be living in his father's shadow. The 62-year-old star made a recovery from liver and colon cancer this year, but doctors believe a second tumor may be present. He has also developed pneumonia. Bedside at a private hospital in Chelsea, West London. A family friend told the The Sun: 'Our prayers are with Robin. He has kept so positive and always believed he could beat this. Sadly, it looks like he has developed pneumonia, which is very bad in his situation. 'If there is anyone you would put money on pulling through such a dire situation, it would be Robin because he is a fighter. Robin revealed his battle with cancer in October 2010. He had emergency surgery to treat a blocked bowel, before a further operation to treat a twisted bowel. Colon cancer was then discovered and it spread to his liver. His twin brother Maurice died of complications resulting from a twisted intestine in 2003, aged 53. Robin famously appeared on the Alan Titchmarsh Show looking pale and gaunt and has cancelled a handful of appearance over the past two years because of his health. Barry Gibb earlier this week jetted into the UK from Tennessee to join other members of the family. Learned that the Bee Gees star was in remission from cancer. Robin-John revealed that he was sitting next to his famous father in his hospital bed when the doctor told them the happy news. 'I leant over the bed and I kissed him on the forehead and just said, "I love you",' RJ told the Mirror. 'Then we sat together for ages, just taking it all in and being together without saying anything. Robin was admitted into a London clinic as part of his treatment and rehabilitation. Treatment.' but it was only a matter of week's before this that Robin insisted he had made a 'spectacular' recovery. Speaking to BBC Radio 2 host Steve Wright, he revealed that he felt better than he had done for a decade. And despite being admitted to hospital last week for further intestinal surgery, the singer had been given the all clear. 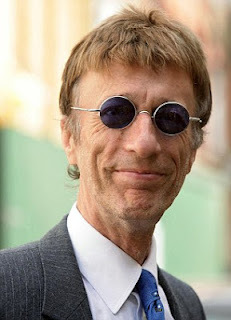 A statement released on the singer's behalf said: 'On Sunday 25 March, Robin Gibb underwent further intestinal surgery. Robin and RJ had composed the music for the Royal Philharmonic performance at Westminster Central Hall next week. In February he had talked about feeling 'fantastic' following his treatment and said he had begun to put on weight after looking increasingly gaunt. At first his illness was thought to have been due to the hereditary intestinal condition which led to the death of his twin brother. In an interview earlier this month, Gibb pondered whether his illness is 'karma' for the fame and fortune.he has enjoyed. ‘I sometimes wonder if all the tragedies my family has suffered, like Andy and Maurice dying so young and everything that’s happened to me recently, is a kind of karmic price we are paying for all the fame and fortune we’ve had.